This workout for beginners establishes correct form and build muscle using resistance machines. When it comes to working out, the human body performs seven fundamental movements: squat, lunge, hinge, push, pull, rotate and walk. It’s important that these are incorporated into your training program. Resistance machines are good for establishing a movement pattern, he says. For example, a beginner probably knows what a squat is but doesn’t have the muscle stability to do one properly. Attempting to squat without that stability risks injury and poor muscle development. However, a leg press machine helps target the necessary muscles so that, after a few workouts, the body will be strong enough to do that squat and other leg-based exercises safely and correctly. With that in mind, beginners should start on resistance machines with squat, push and pull movements. All of the exercises in this workout are performed on selectorized machines. For a refresher on the basics of that machine and other resistance machines, check out our primer that explains what you need to know. Always check the machine for frayed cables, stuck pins and smooth operation. Always maintain proper body alignment and posture. Always make sure the machine is set up correctly for your body type. Always perform the exercise through a full range of motion. Always stop the exercise if you feel pain or discomfort. Remember, Gold’s Gym team members are ready to assist you if you have any questions on how to use the equipment, so be sure to ask for help. The leg press is an ideal first exercise because most individuals cannot perform a full squat correctly due to muscle imbalances or tightness. 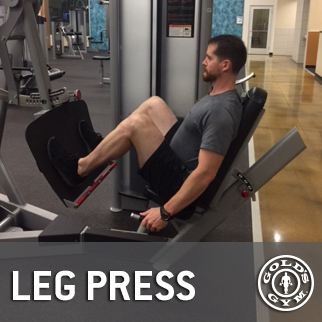 The leg press works all major muscles of the legs together instead of isolating one group over another, which would further compound the imbalances. Place your feet flat on the platform, shoulder-width apart, with toes pointing straight ahead or just slightly outward. Position the seat so the knees are at approximately 90 degrees. Firmly plant yourself in the seat, with your back and head against the pads and your eyes looking straight ahead. Tip: To maintain proper head and neck posture, pretend you are holding an orange beneath your chin. Exhale and press your feet against the platform, pushing it away until your knees are almost straight. (Note: Some machines will have a stationary platform and the seat will move.) When the knees are fully extended but not locked, inhale and slowly allow the seat to return to the starting position without allowing the weights to hit one another. The goal: Do one to two sets of 12 to 15 repetitions with as much weight as you are able to use while maintaining proper form. 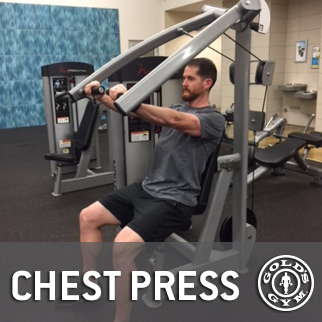 The chest press works the large muscles on the front of the upper body as well as the larger arm muscles that are responsible for pushing away from the body and/or pushing yourself up off the ground. Developing strength in these muscles is important to maintain proper upper body posture and function. Exhale and press the handles away from you until your arms are fully extended. Inhale and return the handles to the starting position without letting the weights slam down. The goal: Do one or two sets of 12 to 15 repetitions with as much weight as you are able to use while maintaining proper form. Be careful not to let the shoulders raise up or allow your back and head to come off the pad during repetitions. 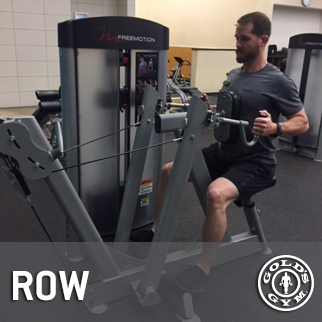 The row builds strength in the major muscles of the upper back and arm that allow you to pull things toward the body. These muscles are also vital for proper posture and overall shoulder/arm function. But many people spend time in a seated position working on a computer, which pulls these muscles out of alignment (think rounded shoulders) and leads to issues such as neck pain, headaches, shoulder pain, etc. The row can help prevent those problems. Start with your feet flat on the floor, with your rear end firmly on the seat. Sit tall with chest up and shoulders back. Keep that imaginary orange snugly beneath your chin and extend your arms to grasp the handles. Exhale and pull the handles back toward your chest, focusing on squeezing the shoulder blades together. Don’t pull too much with your arms. You should feel this movement in the muscles of your upper and mid-back. The goal: Do one to two sets of 12 to 15 repetitions with as much weight as you are able to use while maintaining proper form. Be careful not to let your shoulders raise up toward your ears. The shoulder muscle has three main sections: one on the front of the shoulder, one on the top and one on the rear. As discussed with the chest press and row, the muscles of the shoulder can become imbalanced because of our sitting positions during the day, with more stress on the front part. This can lead to increased risk of shoulder injury, such as rotator cuff injuries. 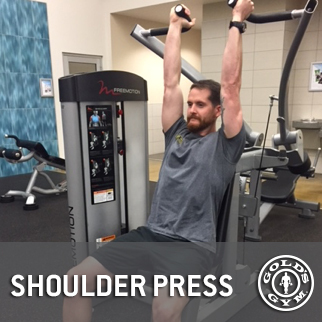 The shoulder press combined with the chest press and row can build increased balance in the strength of the shoulder. Begin in the same basic position as the chest press: both feet on the floor, rear end in the seat, back and head against the pads. Adjust the seat height so your elbows are at 90 degrees and your forearms are perpendicular to the floor. Exhale and press the handles up overhead, keeping your arm in line with your ears. Inhale and bring the handles down in a controlled fashion to where your elbows are back at 90 degrees. Don’t let your head or lower back come up during the movement.